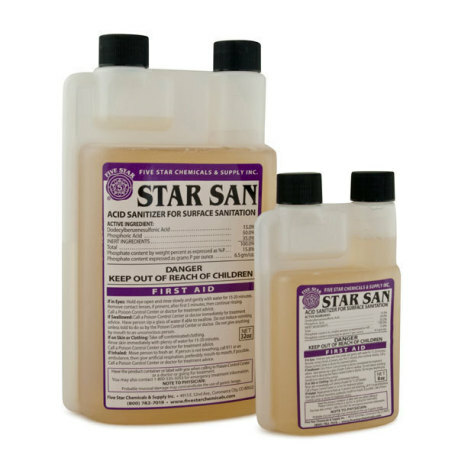 Star San is an odorless, colorless acid-based surface sanitizer that is used heavily in the brewing industry. It works by lowering surface pH to a point that eliminates potential contaminants. While it is effective, it is also safe to use. 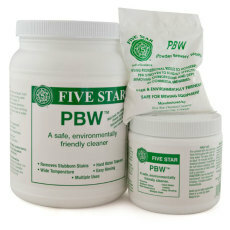 Star San is used at a rate of 1 ounce per 5 gallons of water. Clean equipment can be sanitized with a 2 minute contact time in a solution made at this rate, and no rinse is needed. Star San does foam up, but don't fear the foam! Foam from Star San helps to sanitize in cracks, crevices and other hard-to-reach places. Residual foam left in fermenters and other equipment is safe, non-toxic and will not affect beer or wine. See for yourself why Star San is the preferred sanitizer of professional and home brewers alike! There are a number of sanitizers on the market, but Star-San is my favorite. In the four years since I've switched to it, I've had no issues with infection or off-flavors related to sanitation. It does foam up, but the company motto is, "Don't fear the foam!" Works for what it was intended. Will continue to buy more as needed.